I’ve recently added a new feature to the blog which posts my microblog activity in digest format. Part of this system takes any activity that has associated images and displays thumbnails at the bottom of the post. For the most part this seems to be working well but there was a bug where the images weren’t linking to their associated articles. I’ve fixed this bug and gone back and edited the previous digest posts by hand. Hopefully everything is linking to where it should now. One last issue remains with the digests though. The time on some of the mircroblog entries is off. I know what the issue is and I’ll try to get it resolved over the next few weeks. In the mean time let me know what you think of it by leaving a comment on the web site. I’m considering moving the images to the top of the post too though I haven’t made up my mind about that yet. The first day at GameStorm was a booming success for me. Today was essentially a chance for those who had preregistered to get an early start. Though I don’t have enough experience to say with any authority, it is my understanding that more gaming conventions these days are having early start days. On the agenda for this evening there was really only one thing that really caught my eye though. There was a D&D 4th edition demo as well as a demo of the new D&D Mini‘s system. They were both a lot of fun. I think I’ll be using the new mini’s rules going forward for sure. The dynamics just make more sense than they used to. The new rules also fall closer in line with how the RPG mechanics work so your not constantly reminding yourself “5′ step here, no 5′ step there” among other annoyances. I like the way the 4th edition RPG played out as well. I felt like my special abilities were more accessible due to how often they cycled. This added immensely to the fun factor of playing the game. There will be a bit of a learning curve to it but only because of how unfamiliar some of the new mechanics are and not because they are any more difficult. I think someone coming into the game fresh will have a much easier time of it. One thing in particular about 4th edition I thin will work very well is how difficulty levels of encounters are now calculated. The new system is much simpler and as such building encounters or scaling existing encounters for odd sized groups looks much easier. I don’t know if I’ll go out and buy a bunch of fresh 4th edition books as soon as they hit the shelf but I will make the move eventually for sure. It’s been quite a challenging experience adopting Rocket. He is so full of energy and still has a lot of puppy in him so he’s easily distracted. He did show signs of being a quick learner though and the idea of some formalized training instruction appealed to me. Eight weeks ago we started Beginner Dog Training classes at PetSmart. I really didn’t know what to expect going into it. I have a hard time approaching unfamiliar social situations to begin with but it wasn’t like I was going alone. Rocket was with me. The other dogs in the class were about as diverse as Rockets heritage. They ranged from toys that would fit into the palm of your hand to a head strong but loving Malimute. There were a couple dogs about Rocket’s size too which was a treat for him as it give someone for him to play with. Our instructor, Ashley, was amazing. I found her instruction easy to follow and she was very approachable as well. I found it easy to ask her questions and she always had an informative answer. After the first week I was already seeing results. The course uses clicker training with positive reinforcement. I questioned how well this would work for Rocket at first but it didn’t take long to convince me obviously. Wednesday, being the last class, was graduation for the dogs. We had a little test where we demonstrated the various commands we learned over the last eight weeks. Then we had a couple fun competitions to see who could “stay” the longest as well as who had the most tail wag. We also got to show off any other tricks we’ve learned and Rocket’s buddy Tate showed us a new one, “Dance”. Finally all the dogs got ice cream and graduation pictures. I’ll post Rocket’s picture when it arrives. By the end of the course Rocket would “sit”, “stay”, “down”, “come”, and even “beg”. We still have more work to do to refine his responsiveness and to this end I must remain diligent about continuing his training. I think perhaps in late summer I’ll see if I can afford to enroll us in the intermediate class. Ashley seemed to think he’d do well with it. I had a truly amazing year in 2007. As the year went on, I got more and more ambitious. By Christmas I had so much going on I think the creative part of my mind just shut down. I would wake up in the morning and think about all the things I wanted to do during the day and it was a very long list. I’m only talking about the things I really wanted to do too. There was also all the things I had to do. It got so bad that not only did I start using a calendar but I even scheduled stuff out into 2008. Indecision over what needed doing first became a huge problem and all the while I kept thinking of new projects and endeavors I wanted to start which just added to the confusion. By the time December came around all I wanted to do was focus on our Christmas vacation trip to my parents and nothing else. The blog, podcast, gaming, and everything was on hold at this point. Here we are in the new year and I’ve finally had time to think. I’ve decided it is time to focus my priorities and here is what I have planned for 2008. It’s time to wake up JD’s Musical Alchemy and get back to reviewing the music I love so much. Putting the show together was becoming a chore and taking away from the enjoyment of finding and presenting the music. This was mostly because I kept trying to find better ways to improve the quality at the cost of more labor. My goal for this year is to keep it simple so I can focus on the music. 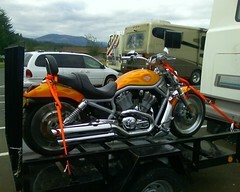 I have a hand full of motorcycle trips scheduled for 2008 already including a rally in Eastern Oregon. Except for the occasional weekend ride I’m going to stick with what I have scheduled instead of trying to fit in every event available this year. Last year I found a cool gaming group that seemed to focus on “organized play” games. Shortly after hooking up with them the coordinator for the group stepped down from his role. I had thought I would be able to help put together game days to keep things moving but it looks like I won’t have the time to learn enough about the games to really do a good job scheduling events. I should be able to fit in the occasional game though and I hope to be able to referee a campaign at some point with a system I’m familiar with. I’m having a blast gaming with the family too. In addition to continuing to play World of Warcraft with the wife, we purchased a Wii just before Christmas and picked up a few new games over the holidays. The Wii has a very different style of console gaming and I’ll go into that in more detail in another post. I have also picked up a number of table top games for the family to play together. We also have a new addition in the family. Rocket is a one year old Lab/Aussie mix. He’s smart, friendly, and a huge ball of energy. We started basic training this week at PetSmart and even after just one class I’m already seeing progress. While Rocket is a family dog, much of the responsibility falls on me as it was on my insistence that we adopted him from the rescue group. The last thing I want to do is work on my painting. Last year I decided to get back into painting in water colors. This year I hope to continue that and perhaps even take a class or two. My next Christmas my goal is to be able to make my own hand made holiday cards. So 2008 is perhaps going to be even more busy than last year. It is my hope that it will be better organized than last year though. It was with a great deal of will power, I went to my first gaming convention. I had never done such a thing before and knew of nobody into the hobby who could join me. After the great time I had at World Wide D&D Gaming Day though I was determined to make the best of it. As it was, my worries were unfounded. Nerdcon 2007 was put on by the Clan of the Cave Nerds and ran Friday November 9th till Sunday November 11th. They are a gaming group that plays at Ancient Wonders in Tualatin on the second Saturday of every month. I was beside myself with the hospitality that greeted me there. My original intent was only to spend a few hours there on Saturday. Getting into a game of Munchkin or something simple seemed like a good start. In the end though, it was the longest and funnest two days I’ve had gaming since I was a kid. And that was a very long time ago. It started out with me asking Ada, the event organizer, questions about the various games that were going on. The setting and system of Living Arcanis perked my interest and they had an introductory adventure planned for that Saturday. One of the other gamers there helped me get a character rolled up and gave me an introduction to the setting. It was at this point Bidimus of the Hinterlands, a ranger, was born. Today, November 3rd, was Worldwide D&D Gaming Day. From what I can tell this was the fourth year they’ve run this particular event. Beyond just encouraging everyone they can reach to go out and game today, they also had a special event setup at participating game shops around the world. One of my local gaming shops, Ancient Wonders, was one of them so I went down there to check it out. The event consisted of a packet for a dungeon master and a group of five players to run a scenario. Not only was this my first Worldwide D&D Gaming Day but it was the first time I’ve sat down with a group of strangers for some serious gaming in about 20 years. I’ve tried to get a game going with my immediate family but that really isn’t the same thing. Beyond being only a partial group which has an entirely different dynamic, but nobody else in my family has the love for D&D that I have. We’ve barely done more than just the Basic Game at this point. I was really nervous about heading down there but I am so glad I did. Everyone was so friendly and I left there wishing it could have gone on forever. The scenario was pretty cool. Each game was supplied with a set of miniatures, stat cards, playing map, module, and dice for the dungeon master and a d20, prepared character sheet, and stat card for the miniature of the character for each player. There were five characters in the adventure consisting of a paladin, fighter, rogue/fighter, sorcerer, and a cleric. Our dungeon master did a great job. He kept it from being too easy but didn’t over complicate it at the same time. Other than some strange liberties the game designers took with some of the details of the scenario it was essentially a regular D&D 3.5 edition game. The anomalies were interesting. For example, there is a common adventuring pack that almost all characters start out with as a rule of thumb. This has been a D&D tradition for as long as I can remember. This pack usually consisted of some oil, 10′ pole, metal spikes, rope, and a hand full of other odds and ends. These characters had none of that. There was also the choices of spells the various casters had to use and the odd balance of some of the statistics. Once we completed the scenario it became clear how these things would have changed the course of the game though and since this was a small one off adventure perhaps the desire was to limit possibilities. Dice rolls were not in our favor today however and alternative methods of making our way through the quest would have been appreciated. The game just before ours ran about three hours. Our game ran about five. In the end though, we all had a blast. I learned a little more about playing D&D and have the bug to want to play more than ever. Next weekend is an event in Portland, OR called Nerdcon 2007. I’m planning on attending to see if I can get in on even more games. At the very least, I know they have some Munchkin games going, which I love, and our dungeon master from tonight is going to be there running some games. I look forward to seeing how it goes. Have you ever felt like your life was missing something or even simply not playing out the way you wish it was? This is a problem I’ve been struggling with lately. As a kid, say about 10 or so, I was really into pencil and paper based role playing games. That is to say, I was into them for a short while at least. Advanced Dungeons & Dragons from TSR had just been released and I had the pleasure of getting my hands on an original Basic Set. A couple of my friends from the neighborhood and I would sit around taking turns as Dungeon Master on the weekends and explore a whole new dynamic in gaming. Our new gaming group was cut short when my family ended up moving out of the country only a year or so later. Finding gaming books at that time was difficult to begin with. Finding English books in a foreign country was even harder though. I found comfort in computer role playing games, though the restrictions of a computer environment prevented the experience from even coming close to playing around a table with friends. After a few years I finally found some friends with similar interests and we started a new gaming group. Our gaming materials were still limited to imports or what we brought with us but we weren’t going to let that stop us. Alas, all good things must come to an end. Once again I ended up moving and had to leave my new gaming group behind. Lately I’ve been longing to game again. I’ve recruited the family into a pseudo gaming group but there are too many empty chairs to get the full experience. Most of my friends are into electronic gaming and have no interest in the unplugged variety. To make matters worse many of the bloggers and podcasters I follow on the internet are gamers. Every other day I’m constantly hearing about games they held, pictures of gaming parties, or the latest games from the cons. Over on Dragon magazine, Shelly Mazzanoble has an excelent article called “How Shelly Got Her Game Back” about losing her favorite Dungeon Master and the thrill of getting a new one. It makes me long to have a Dungeon Master at all. For now I have my online games. It isn’t the same thing at all but it’s something. I just hope that at some point in the future I’ll be able to have the life I picture myself living, full of polyhedral dice and adventures untold. We were out taking a walk the other week and came across this beautiful custom V-ROD. The customizations were slight but gave it a very striking look.